I am looking around for an old mountain bike to ride this winter (and this summer when it is wet). Sheldon Brown has a good description of both kinds of brakes but he does not give pros and cons. Or suggest which are better. The main reason that the direct pull (V brake) was invented is that it approximates a center-pull cantilever in terms of balanced force and leverage, while not requiring that the cable be anchored at some point above the wheel. This is important for front wheels on suspension forks, but not significant for most other uses. Another slight advantage of the V brake is that it doesn't generally protrude out of the profile of the bike quite as much and is thus somewhat less likely to be damaged in off-road use. Neither advantage is of any importance for a road bike without a suspension fork. However, there is the problem that the two require different levers (because the cable travel length is different) and the old cantilevered levers are getting hard to find, should you break one. So much was wrong with cantilevers and linear-pull came along and made the cycling world a happier place. the front cable often routed via the stem on a pulley hidden inside the stem. Over time this pulley would fray the cable and the cable would break on the front brake with no external signs of anything wrong. Unless a reflector bracket or mudguard was in the way, the broken front brake cable would release the stirrup wire to then catch against the front wheel. This would cause an instant straight-over-the-handlebars disaster. Even in peace-time the arrangement was not too good, the brake adjustment depended on stem height. Some bikes did not use the stem to hold the front brake cable. Instead they used an extra bracket in the headset. When suspension came along a bracket had to be added to the forks to hold the cable. The bolt at the end of the cable holding the yoke that connects to the straddle wire was also a bit of a problem. Typically these were setup crooked. In use the stirrup could get knocked to one side, compromising the brake balance. 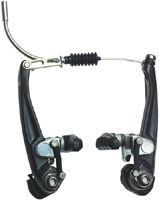 As for the rear brake, the big problem on early models was how they stuck out to catch your heel. This was solved when Dia-Compe came along with the 986 to replace the 983. Shimano copied the hi-rise idea shortly thereafter. We are talking twenty+ years ago with this 'big change' to the cantilever. There were many, many iterations to get to the linear-pull brake you have today. Direct-pull or "V" brakes are stronger, easier to set up and maintain, and are usually considered an improved technology. Well set-up cantis are not bad, however, and the pads do last a long time. 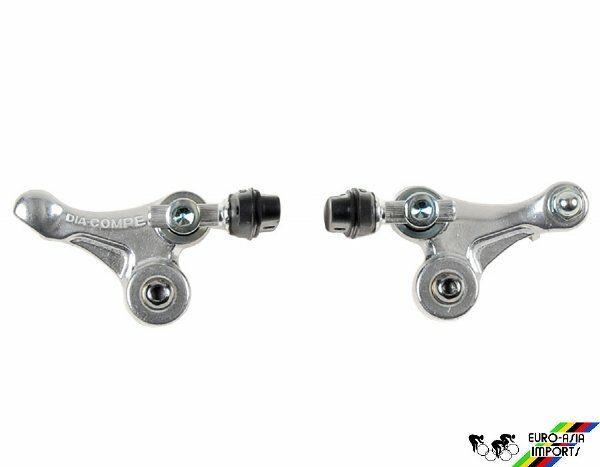 Difference on canti and v brake's can be affected by your use, which is implied but not explicit in some of the responses. 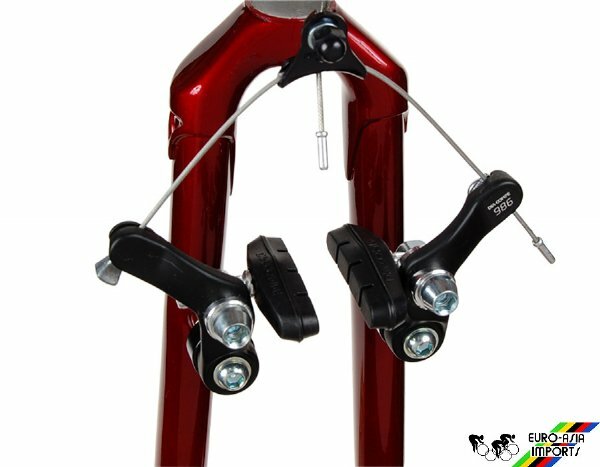 Canti pull ratio works with the pull ratio of road bikes--which is why they are used on cross bikes--not because of mud clearance since cross bikes use road brake/shifter levers. 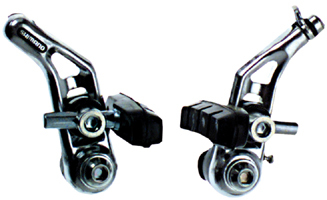 You can use V-brakes with a road brake/shift lever but it requires the use of a travel agent to alter the cable pull from the cant ratio to the V brake ratio. These can be complicated to install, don't always work well, and can become fouled in the mud of cyclocross. I believe one pro of canti's are that they tend to have more mud clearance. I think that is one of the reasons that cyclocross bikes run them, at least until they started allowing discs. As the brake is applied, the ground applies a force directed backward on the tire as shown, causing the fork to flex backward. Problem is, the brake cable is fixed at one end at the brake caliper and at the other end at the cable stop above the headset (as you can see in my case, at a cable hanger attached to a bolt on the stem face plate). Think “bow and arrow” and imagine the fork between the cantilever bosses and the top of the headset is like the bow, and the cable is like the string. As the fork flexes back due to braking, the cable tightens like the string in the bow, because its two ends – the cable hanger and the brake calipers, have moved further apart. So even though you may have pulled the brake lever carefully enough to modulate it properly, as soon as the pad slows the wheel down, the fork flexes back and tightens the cable, which in turn pulls the pads harder against the rim. This in turn flexes the fork back further, which tightens the cable more, which pulls the pads harder against the rim, and so on. Eventually, something has to give: Either the tire must slip on the ground, the rider must go over the handlebars, or the pads must break free from the rim. It is the latter that creates the shudder, the pads bind and release, bind and release, each time allowing the fork to flex back and forth and the tire to roll and stop, roll and stop. This is why the problem goes away in mud and wet sand, because the pad can break free smoothly. It is also why smaller pads with more toe-in help. (*) mounting the cable stop to forks instead of the headset will solve this problem. My bike brakes are lethal, help!